There’s something about substances which we are intrinsically inflexible and solid being used to make something look curvy and soft that amazes me. I suppose it’s another one of those ironies that I’m drawn to in life. While not any known or respected sculptor, I dabbled and stone, metal and wood carving. I would have LOVED to have had a chance to work with bigger metal, it’s so satisfying. I respect any artist who has pursued this endeavor and made a body of work that is uniquely recognizable and inspiring. To have that artist be a woman is even more of an inspirational marker to me. 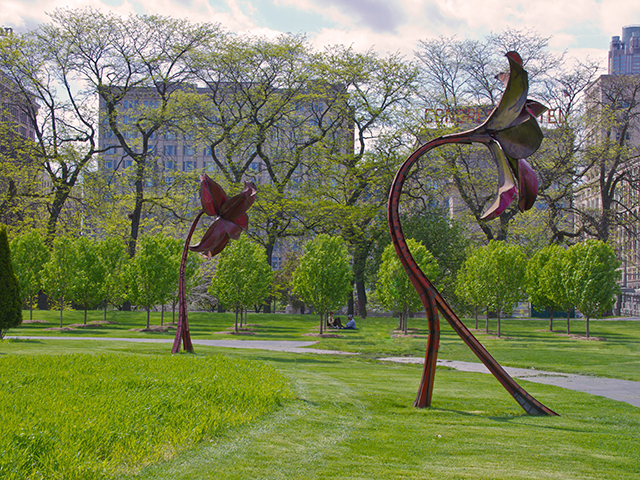 (Sorry guys, but as a woman, I respect how it is to be one and see many more men succeed than I do women, so yay to Dessa Kirk who created these 4 amazing metal lilies placed in Grant Park. The installation is magnificent and yet one more reason for me to admire this sculptress. She is known for recycling the metal of Cadillacs and turning it into art such as these flowers and the Daphne Garden on Northerly Island (formerly Meig’s Field). There is a beautiful back story to the Cadillacs, you can read about it here. I guess you could say it was that perfect, new leaf on trees time of year when I took this. At that time I didn’t know who exactly Dessa Kirk was, but her word is certainly identifiable as being hers. I’m clapping loudly for a woman I respect in the arts.